While we have been successful at treating certain types of childhood cancer—thanks to increased awareness and a modicum of funding—the success rates for many other types of childhood cancer are not good. These rarer types of childhood cancer are not so rare when viewed as a whole, as together they account for a good portion of all childhood cancers. Further, even for those childhood cancers with relatively high 5-year survival rates, it is estimated that up to 75% of childhood cancer victims will suffer from a serious—or fatal—complication from the treatment they underwent as a child. A “vicious circle” exists with respect to most types of pediatric cancer: They are rare enough that little awareness exists and very little or no research is being done; therefore no new drugs or therapies are developed; therefore children affected by some of these types of cancers are sentenced to almost certain death. No child should ever have to face that kind of future. 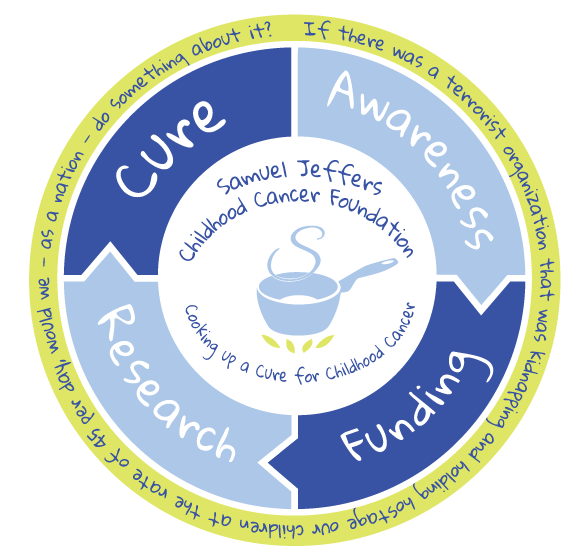 We hope Sam’s Foundation will make a positive impact on some of these rarer types of children’s cancer and also reduce the risks of relapses, secondary cancers and health complications from current treatment plans. Our organization wants to break the vicious circle and instead start a “virtuous circle”, where awareness leads to funding which leads to research and ultimately cures for our children.